Willem van de Velde (II) – Mauritshuis 201. Title: Ships in the Roads. Date: c. 1658. Materials: oil on canvas. Dimensions: 66.2 x 77.5 cm. Nr. : 201. 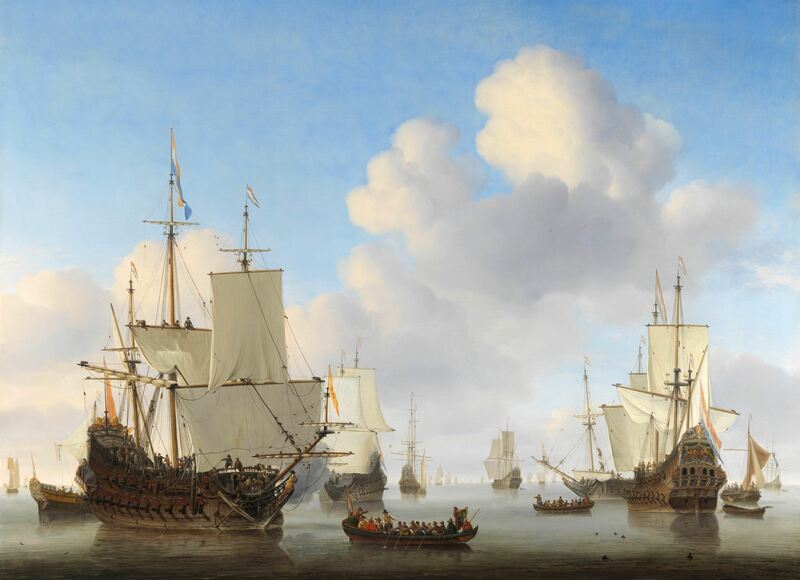 Inscriptions: w / v. v. Source: https://www.mauritshuis.nl/en/explore/the-collection/artworks/ships-in-the-roads-201/#. I have changed the light and contrast of the original photo. Willem van de Velde (II) – Rijksmuseum SK-C-1743. Title: The Surrender of the Royal Prince. Date: c. 1670. Materials: oil on canvas. Dimensions: 97.5 x 128 cm. Nr. : SK-C-1743. Source: https://www.rijksmuseum.nl/en/collection/SK-C-1743. I have changed the light and contrast of the original photo. Willem van de Velde (II) – Wallace Collection P 137. 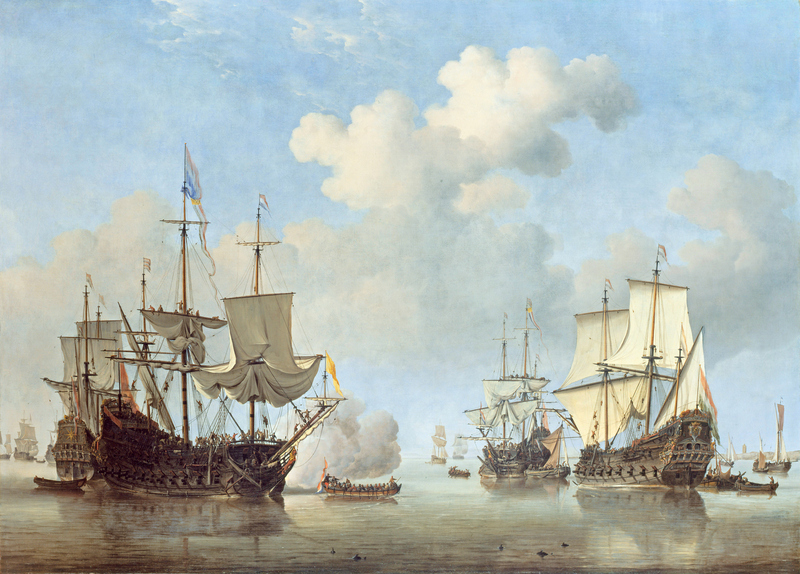 Title: Calm: Dutch Ships coming to Anchor. Date: c. 1655. Materials: oil on canvas. Dimensions: 169.9 x 233 cm. Nr. : P 137. 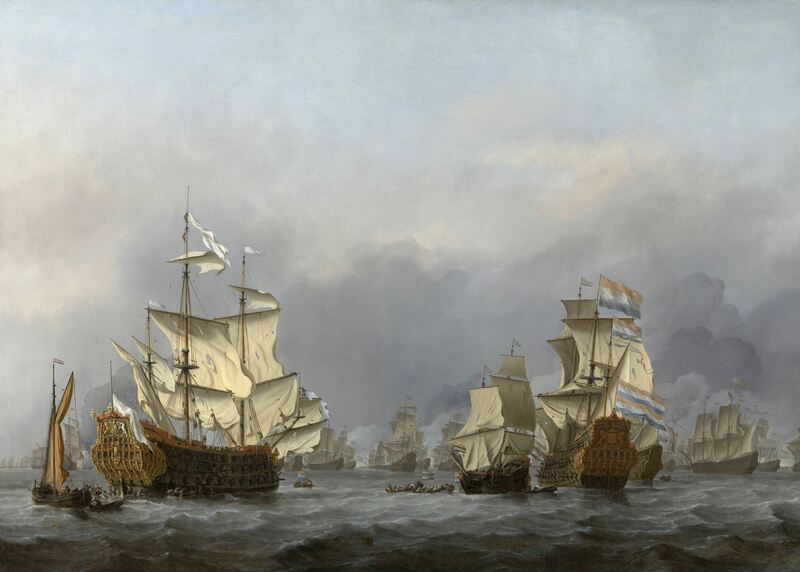 Source: https://commons.wikimedia.org/wiki/File:Willem_van_de_Velde_(II)_-_Calm_-_Dutch_Ships_Coming_to_Anchor_-_WGA24523.jpg. I have changed the light, contrast and colors of the original photo. Willem van de Velde (II) – Amsterdam Museum SA 7421. Title: De Gouden Leeuw op het IJ voor Amsterdam. Date: 1686. Materials: oil on canvas. Dimensions: 179.5 x 316 cm. Nr. : SA 7421. 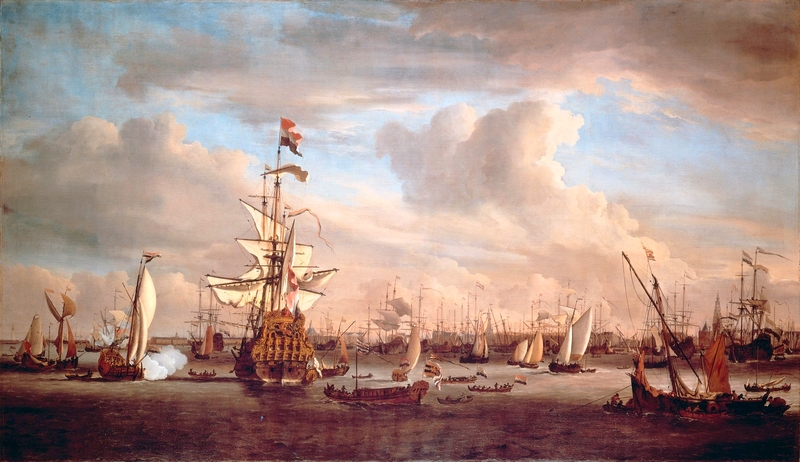 Source: https://commons.wikimedia.org/wiki/File:The_IJ_at_Amsterdam_with_the_former_flagship_%27Gouden_Leeuw%27_(Willem_van_de_Velde_II).jpg. I have changed the light and contrast of the original photo. Willem van de Velde (II) – Rijksmuseum SK-C-1707. 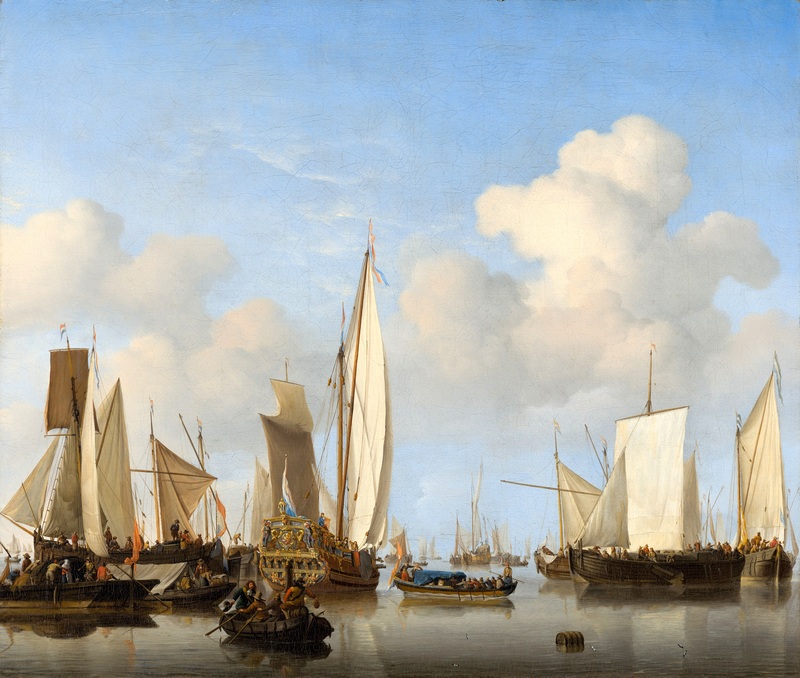 Title: Dutch Ships in a Calm. Date: c. 1665. Materials: oil on canvas. Dimensions: 86.8 x 120 cm. Inscriptions: willem:van velde f. Nr. : SK-C-1707 Source: https://www.rijksmuseum.nl/en/search/objects?q=sk-c-1707&p=1&ps=12&st=OBJECTS&ii=0#/SK-C-1707,0. I have changed the light and contrast of the original photo.